This trail is a favorite destination on a hot summer day as it ascends through shaded forests along Sypes Creek. Glacier lilies (Fritillaria pudica) and shooting stars (Dodecatheon pulchellum) are present as soon as the snow melts and common harebells (Campanula rotundifolia) and asters (Erigeron spp.) bloom until late September. Sypes Canyon trail can be hiked in early spring to early winter before snow and ice make the trail somewhat treacherous for casual hikers. 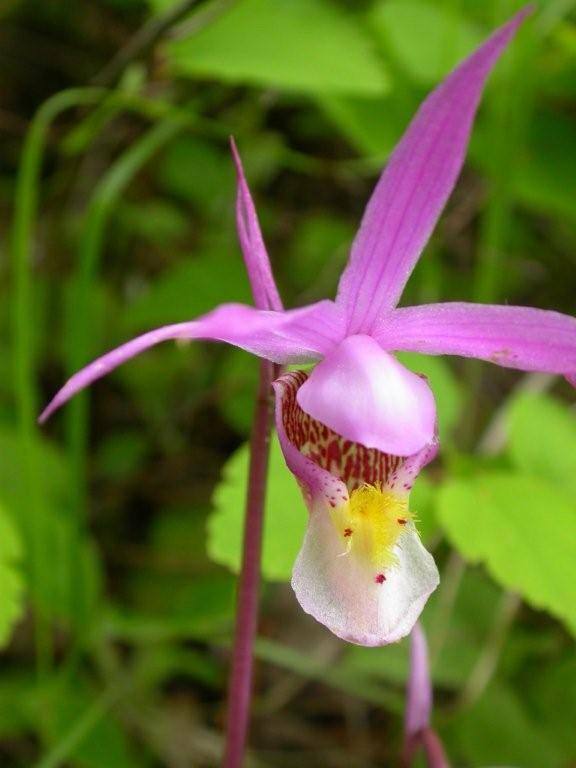 The beautiful and rare fairy slippers or calypso orchids (Calypso bulbosa) are found on this trail in addition to hundreds of other wildflowers. Striped coralroot (Corallorhiza striata) is also a favorite of ours—a showy, 6–16” tall dark reddish purple-stemmed plant with small red-and-white striped flowers that resemble orchids. This non-chlorophyll producing plant is usually found in wooded and shady areas. From I–90 and the North 7th Avenue overpass, drive 2 miles north on 7th Avenue (West Frontage Road) to Springhill Road. Turn right at the light and drive 1.5 miles to Sypes Canyon Road. Turn right and continue 3.2 miles to Churn Road. Turn right and go 50 yards to the signed trailhead at the end of the road. Please respect the “No Parking” areas that are reserved for residents in the area. Overflow parking is available across from the mailboxes. The trail heads east through a grassy, fenced access and then enters a lush forest canopy into Sypes Canyon following Sypes Creek on the southwest slope of Baldy Mountain in the Bridger Range and ending on an overlook with outstanding views of the Gallatin Valley, Bozeman, and the Madison, Gallatin, and Tobacco Root Ranges. The trail crosses several seasonal streams and dips occasionally to Sypes Creek. In late spring watch for Canada violets (Viola Canadensis) under the canopy of many berry-producing shrubs along the trail, including black hawthorn (Crataegus douglasii), serviceberry (Amelanchier alnifolia), and chokecherry (Prunus virginiana). Cross over to the north side of the creek, and head up the north wall of the canyon above Sypes Creek. Wild strawberries (Fragaria virginiana), Wood’s rose (Rosa nutkana), western meadowrue (Thalictrum occidentale), and red-osier (aka red-twig dogwood) (Cornus sericea/stolonifera) bloom in early June and add a garden-like appearance to the trail. The flowers and shrubs attract birds and butterflies all season-long. About ½ mile from the trailhead, the trail starts steeply up a narrow path to a ridge. Along the ascent watch for late spring flowers including many-flowered stickseed (Hackelia floribunda), heartleaf arnica (Arnica cordifolia), field chickweed (Cerastium arvense), prairiesmoke (Geum triflorum), and Oregon grape (Berberis repens/Mahonia repens). The trail then descends alongside a rock wall cliff into the lush, forested canyon. Rock clematis (Clematis columbiana), sticky geranium (Geranium viscosissimum), false Solomon’s seal (Smilacina racemosa/Maianthemum racemosum), and long-leaf phlox (Phlox longifolia) are a few of the flowers seen along the upper reaches of Sypes Canyon. The trail curves right at one mile, heading south up the canyon while skirting the edge of the national forest boundary. Another steep ascent and switchback marks an area with an abundance of fairy slippers or calypso orchids (Calypso bulbosa). Watch for them in mid-to-late June or early July. 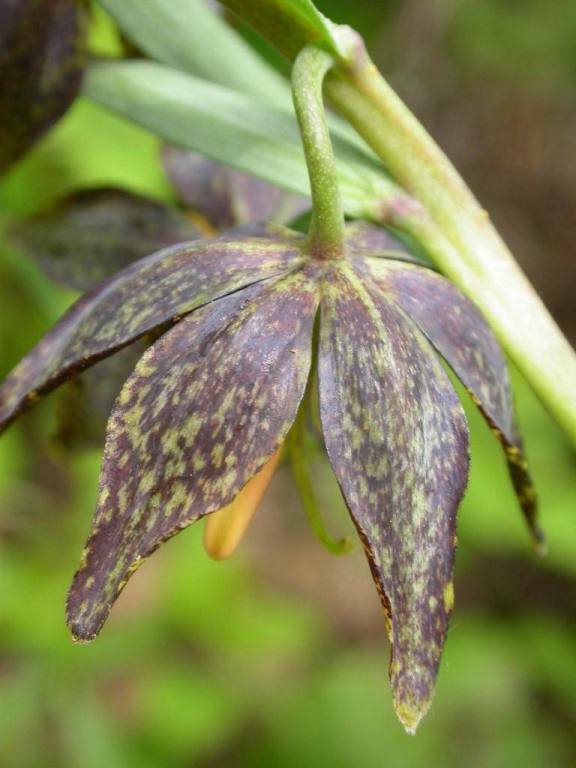 The ascent continues through the shade of a lodgepole pine forest and past chocolate lilies (aka leopard lilies) (Fritillaria atropurpurea), a heavily camouflaged brownish flower with leopard spots. Watch for poker heuchera (aka round-leaved alumroot) (Heuchera cylindrica), showy Jacobs’s ladder (Polemonium pulcherrimum), and striped coralroot (Corallorhiza striata). In July 2008, the meadows were a garden of pink and blue with wild bergamot (aka bee balm) (Monarda fitulosa) and showy fleabane daisy (Erigeron speciosus). A trail sign marks the intersection of Sypes Canyon Trail with the “Ridge Trail.” Bear right 200 yards to a vista overlook of Bozeman, the Gallatin Valley, and the Madison Range. The trail ends in a large meadow that in the late spring is full of lupine (Lupinus spp. ), arrowleaf balsamroot (Balsamorhiza sagittata), larkspur (Delphinium bicolor), sagebrush (Artemisia spp. ), and bluebells (Mertensia spp.). This is a great spot to relax, picnic, and enjoy the views before returning back down Sypes Canyon Trail. To hike further, the trail continues to climb to a junction with the Foothills National Recreation Trail. Trails may be open to mountain bikes and horses. No bikes are allowed on Saturdays. Check with the Gallatin National Forest Offices or refer to the signage at the trail head. 5-30-09 Most of the early flowers are blooming with an especially nice display of Canada violets, rock clematis, larkspur, and calypso orchids. The beautiful calypso orchids are at their peak. Nearly 50 other flowers were logged on this date. Spring beauties, glacier lilies, and shooting stars are about over except near the top of the trail. 6-5-11 Flowers are a couple of weeks late due to heavy snows and cold weather. Today was 82° and clear with lots of bikes, people with dogs, and joggers. Most of the early flowers are blooming with glacier lilies being the flower of the day. Other flowers near peak bloom included Canada violets, arnica, ballhead waterleaf, wartberry fairy-bells. Yellow draba spp. flowers were very showy in the steep rock crevices on the left of the trail. 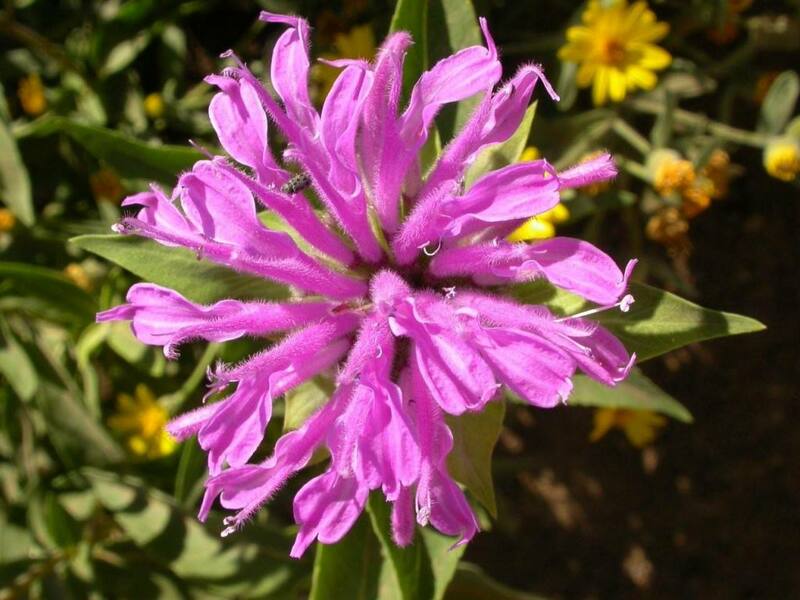 Flowers that were between 40 and 80% peak included larkspur, mountain bluebells, and arrowleaf balsamroot. Spring beauties, yellowbells, shooting stars, Coos, Wyoming kittentails, biscuitroot, and pasqueflowers were still blooming on top of the ridge. 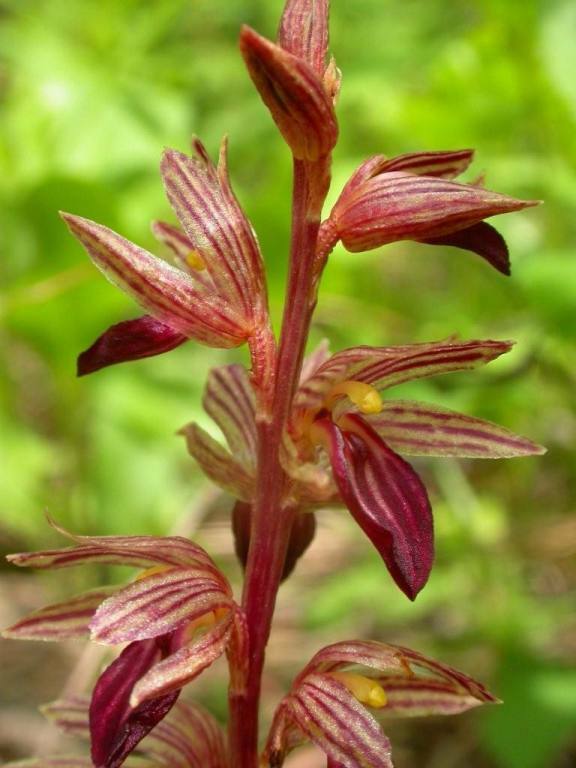 Larkspur, calypso orchids, sugarbowls, and rock clematis were just starting to bloom. A few chocolate lily buds were found on their long stems in the woods. Other flowers found here and there include blue-eyed Mary, narrow-leaved collomia, fern-leaved lovage, and strawberry. Flowers are generally two weeks earlier than last year. Most of the early flowers are blooming with glacier lilies, Oregon grape, rock clematis, wartberry fairy-bells, and Canada violets being the showiest flowers of the day. Surprisingly, the calypso orchids are blooming and should peak in a week or two. There is a nice showing of yellow draba spp. at the summit of the first climb to the rock face. Where the trail splits, we took the left (N) trail and found many of the early spring flowers still blooming (pasqueflowers, yellowbells, spring beauties, and shooting stars). Serviceberry is also in bloom. Other flowers seen include false Solomon seal, ballhead waterleaf, spring beauty, Coos biscuitroot, mountain bluebells, buttercups, twinflower (Utah) honeysuckle, Hood’s phlox, miner’s lettuce, arnica, fern-leaved lovage, chokecherry, arrowleaf balsamroot, alpine stars, field chickweed, long leaf phlox, nine-leaf parley, lemonweed, collomia, threadleaf phacelia, larkspur, and Nuttal’s violet. 6-5-14: 75° and clear skies at 2:00 pm. Beautiful day to hike Sypes Canyon. We only had a couple of hours so we hiked to the rock outcrop where the trail starts downhill. It was a stellar day for Canada violets, wild hyacinth (brodia), star-flowered Solomon seal, many-flowered stickseed, silverleaf phacelia, arrowleaf balsamroot, heartleaf arnica, low larkspur, mountain bluebells, yarrow, and fernleaved lovage. The mountain ash and chokecherry bushes were in full bloom; the scent of chokecherries permeated the air along the trail. Other flowers noted included: baneberry, field chickweed, poker heuchera (alumroot), threadleaf phacelia, fuzzytongue penstamon, lance-leaved stonecrop, springbeauty, lupine, woodland star, and Western gromwell (puccoon). Photos on this page (Top to Bottom): Striped Coralroot, Calypso Orchid (Fairy Slipper), Bee Balm, Chocolate Lily (Leopard Lily) Click to Enlarge.